2019 Milwaukee Brewers Season Preview: Can they go beyond their 2018 achievements? Editor’s note: Baseball is back and Yahoo Sports is previewing all 30 teams over the next month. This year’s previews will focus on fantasy and reality, as our MLB news staff and our fantasy baseball crew come together to assess each team before opening day. Next up, the Milwaukee Brewers. In case you didn’t pay attention to baseball in 2018, you might have missed this: The Milwaukee Brewers are good. Really good, in fact. Like, made-it-to-the-NLCS-and-pushed-the-Dodgers-to-seven-games good. 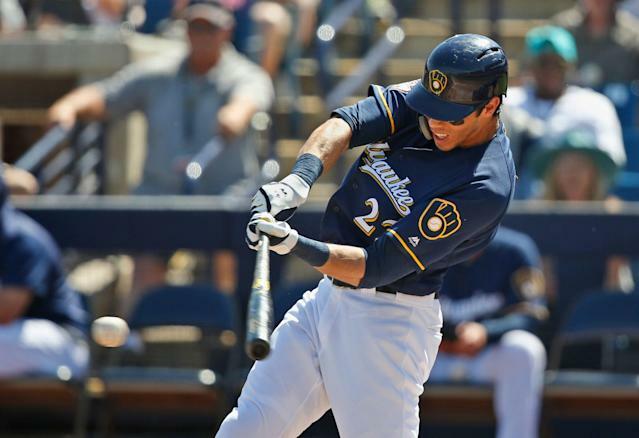 And the Brewers’ offseason moves have them looking even better. The Brewers won the NL Central last year with their potent bullpen and an MVP performance from Christian Yelich. After adding Yasmani Grandal as their new catcher and re-signing Mike Moustakas and moving him to second base, the Brewers’ lineup is stacked. The only question mark is the starting pitching, where there’s no eye-popping ace. However, it’s mostly the same group that got it done last year, so doubting the Brewers at this point might be futile. The bullpen — led by the versatile Josh Hader and closer Corey Knebel — can more than pick up the slack. The Brewers are deep, versatile and dangerous, whether we’re talking about reality or fantasy. And they might just be the best team in the NL Central. The Brewers made upgrades, some unexpected. They weren’t, for example, the team you expected to sign Grandal. But they also didn’t do a ton to upgrade their starting pitching, which seems to be their only weakness. As we said above, they have proven they can win with what they have, but it still would have been a way to improve the team’s path to victory in a tough NL. There have been rumors lately that they’re interested in signing Craig Kimbrel, which could make that daunting bullpen even better and perhaps even lessen the importance of their starters, so watch for that. Who will be Milwaukee’s best fantasy buy? What is Milwaukee’s biggest fantasy question? Again, we don’t have many burning questions with this collection of reliable veterans. It’s fair to wonder, however, if Christian Yelich can possibly approach last season’s value. We’re drafting the reigning MVP in the middle of the first round (ADP 8.3), almost as if another 36 homer-110 RBIs-118 run-22 steals-.326 campaign is guaranteed. And maybe it is. There’s little doubt that Yelich is going to rake; he’s likely to again approach 100 runs and RBIs, assuming good health. But he’s always been a line-drive/ground-ball hitter and we can’t reasonably expect him to produce another HR/FB rate like last year’s (35.0). Most projection systems have him slipping back into the mid-20s in home runs. Hopefully fantasy owners will be content if he simply delivers a 100-25-100-18-.310 sort of season. 1. Rotation comes together: The Brewers pitching staff finished top five (3.73 ERA) last season despite not having a true ace. 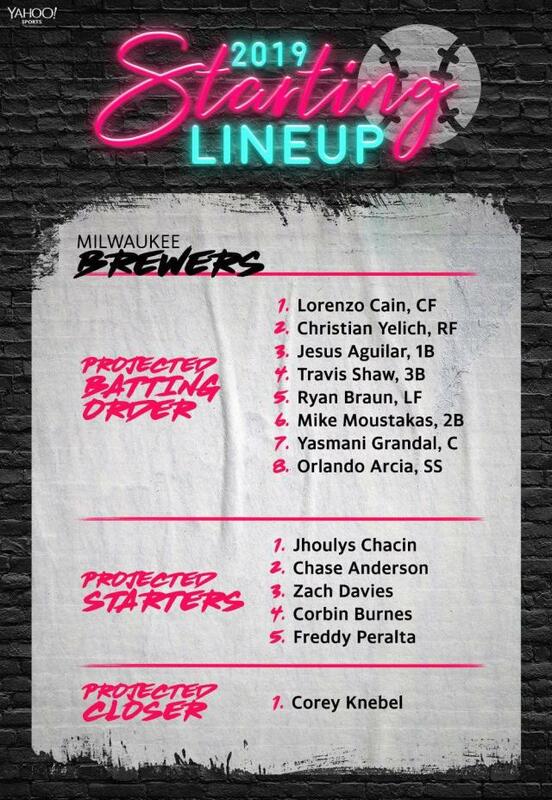 The setup looks similar entering 2019, meaning Counsell and company will need to piece things together effectively. On the plus side, they should have enough depth to field a competitive rotation. Despite losing Wade Miley in free agency, the Brewers have Jhoulys Chacín, Chase Anderson, Zach Davies, Brandon Woodruff, Corbin Burnes, Freddy Peralta, Junior Guerra, and a a returning Jimmy Nelson in the mix. On the down side, that group doesn't figure to chew up innings. They better, or the bullpen will be taxed again. 2. Mike Moustakas fits in at second: To make room for Moustakas' return, the Brewers will shift him to second base full time in 2019. It's a big change for a 30-year-old who's played almost exclusively at third base during his professional career. It's a defensive sacrifice that Milwaukee is willing to make because of Moustakas' offensive production, and one they might be able to mask some by using shifts and hopefully striking out a lot of batters. At least, they better hope so. The biggest thing for the Brewers this year is just keeping that same energy from 2018 that got them to the NLCS. Yelich, Cain, the bullpen, Jesus Aguilar — if they can all be like their 2018 selves, the Brewers will be good.